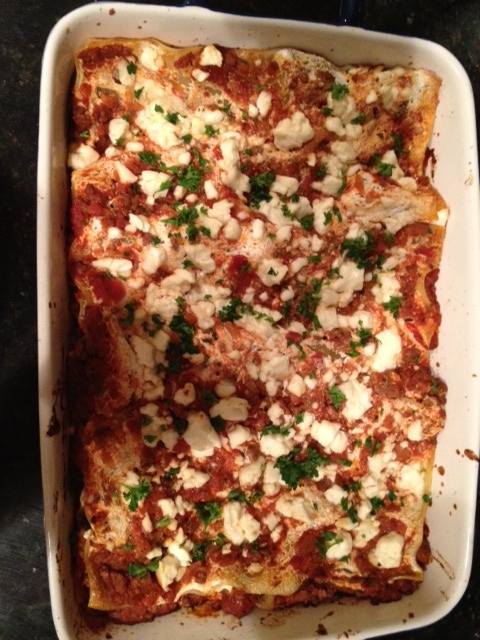 Lamb and Feta Lasagna | Om nom nom! This month’s Cooking Light has a feature on lightened lasagnas. Can’t beat low-cal lasagna! Oddly enough, the lightest of the bunch was a lamb and feta. Two things we both loved, lower-cal…that’s a winner! I did not deviate from the recipe except to use my own tomato sauce instead of canned, and it was very good as-is…the only change I would make besides would be to add some spinach for some bulk and color. I would stay to stick with an actual marinara/tomato sauce over just the canned crushed tomatoes – whether homemade or a jar, it will lend more flavor. Definitely a great “light” lasagna! This made a ton so plenty of leftovers for lunch, or a lazy cooking night…always a good thing! Heat a large skillet over medium heat. Add oil to pan; swirl to coat. Add onion and next 4 ingredients (through beef); cook 14 minutes or until lamb and beef are browned, stirring to crumble. Add stock to pan; cook 3 minutes. Stir in salt, pepper, and tomatoes. Bring to a boil; reduce heat, and simmer 4 minutes, scraping pan to loosen browned bits. Combine ricotta and rind in a small bowl. Spread 1 tablespoon ricotta mixture over one side of each lasagna noodle. Spread a couple of spoonfuls of tomato mixture in bottom of a glass or ceramic baking dish coated with cooking spray. Arrange 3 lasagna noodles, ricotta side up, over tomato mixture; top with more tomato mixture. Repeat layers twice, ending with tomato mixture. Sprinkle evenly with feta cheese. Cover with foil; bake at 375° for 40 minutes. Remove foil; let stand 10 minutes. Sprinkle with parsley. Makes 8 (generous) servings at 311 calories per chunk o’ lasagna. Pretty good for lasagna! If I had any left, I would have used reduced fat feta for this…definitely recommend that. Was totally eying up this recipe in CL – glad to hear it’s good!